Turning the time machine back to nursery days, one sees a tiny seed of an institution germinating, taking root and blossoming into a full-grown verdure plant. Completing 20 years in 2014, as it steps into its mature years, one finds it branching out in all spheres of holistic development of an individual, taking pride in providing socially relevant and innovative curriculum, out-of-the-box ideating platform for growth, and youthful energy to its students and faculty. Running 10 undergraduate programmes in all the three important streams: Arts, Commerce and Sciences, it nurtures interdisciplinarity and competency exchanges in the form of inter departmental research and outreach programmes. 'Tell me and I forget. Teach me and I remember. Involve me and I Learn.' These words seem to be the echo that resounds in every page of MAC. The veracity of this saying is nowhere better illustrated than in the classrooms of MAC because they are learner-centric. The thrust has always been on two-way communication: a process of building partnerships between the learner and the learned. It can be said that learning is no longer sacrosanct to be monasticated in a sanctuary of classrooms and library. It spills over in the lawns, on the stage and in playgrounds. In fact MAC can boast of 'classrooms without walls' as learning happens on field-based innovative research projects, adoption of villages such as Baroji and educational trips. Participation of the students in the extension activities of the college with vigour and enthusiasm has led to strong bonds between the residents of Baroji in Mewat District of Haryana; and the experiential Learning through The Leadership Development Program, an initiative of the NSS in the college has helped students work towards the upliftment of localities in the vicinity. The years 2012 and 2013 brought several international scholars to MAC in two well-attended International Conferences in the broad areas of International Relations and Cultural Studies. These vibrant scholarly initiatives have paved way for a string of national-international conferences organized by the various departments every year totally to 17 conferences by the end of 2015. The year 2014 cemented our efforts to sustain and encourage academic excellence geared towards innovation and research by being awarded the second prize in the competitive category of 'College with Good Practices'. This was possible only because the college continued to promote and encourage research and innovation. An efflorescence of the innovative and creative energies of the tudent faculty teams saw the award of 21 Innovation projects, interdisciplinary In nature, approved and funded by the University of Delhi. 2 projects were Completed in 2013-14, 10 in 2014-15 and 9 ongoing projects were approved in 2015. Rs 20 Lakhs was sanctioned by Delhi University for student projects during the year 2012-13, Rs 38.5 Lakhs in 2013-14 and Rs 35 Lakhs for ongoing projects in 2014-15. Each project led by three faculty members from different departments and ten students seeks to bring about real and evidence based change within the college. 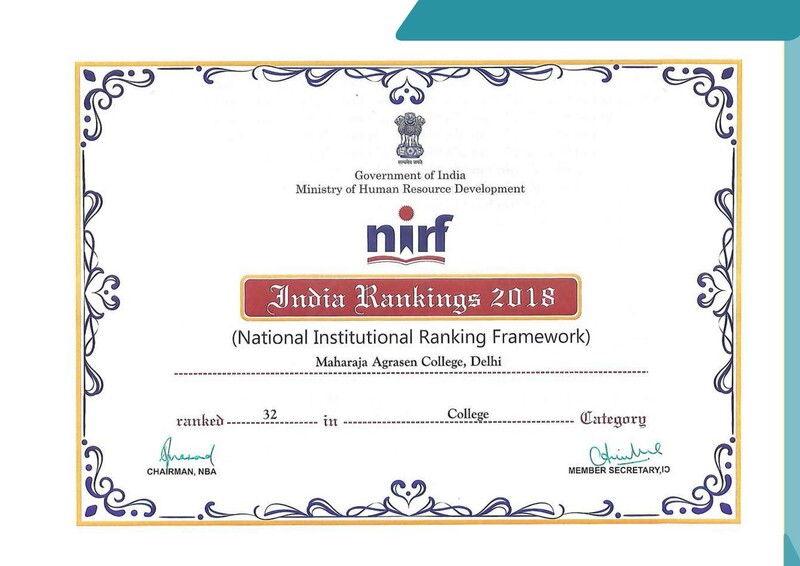 The vision of Maharaja Agrasen College is to make quality the defining element of education of the students and set the standards for higher education in the University of Delhi in the twenty-first century. We are committed to creating and sustaining the conditions that enable all Maharaja Agrasen College students to experience an unparalleled educational journey that is intellectually, socially, and personally transformative. The mission of Maharaja Agrasen College is to educate the citizens and citizen-leaders for our society. We do this through our commitment to the transformative power of higher education in arts, commerce and sciences. Beginning in the classroom with exposure to new ideas, new ways of understanding, and new ways of knowing, students embark on a journey of intellectual transformation. Through a diverse living environment, where students interact with people who are studying different topics, who come from different walks of life and have evolving identities, intellectual transformation is deepened and conditions for social transformation are created.